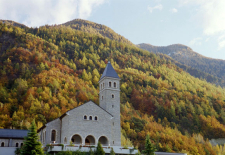 The General Chapter of the Society of St. Pius X opened Monday, July 9, 2012, at the seminary of Econe (Switzerland), and will continue until Saturday, July 14. The object of this meeting is to examine issues that arise between the elective chapters that take place every 12 years - the next will be held in July 2018. In the present context, following the response of Cardinal William Levada, Prefect of the Congregation for the Doctrine of the Faith, on June 14, 2012, this chapter will permit the Superior General, Bishop Bernard Fellay, to make known the state of relations of the Society of St. Pius X with Rome, and obtain feedback from the capitularies on this subject. Discussions are being conducted in a fraternal atmosphere, marked by cordiality.